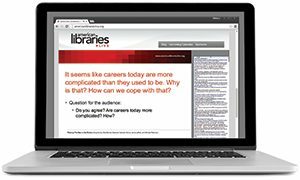 The focal point of Fenwick Library’s redesign is a new research commons that provides ample open space to accommodate easy access to technology, specialized librarians, special collections, and tutoring services. 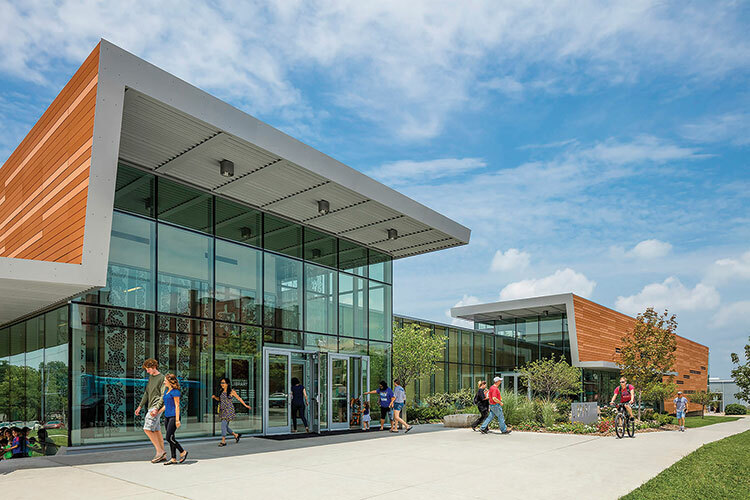 Sustainable strategies include external shading devices, a rooftop garden, and a naturally irrigated rain garden onsite. 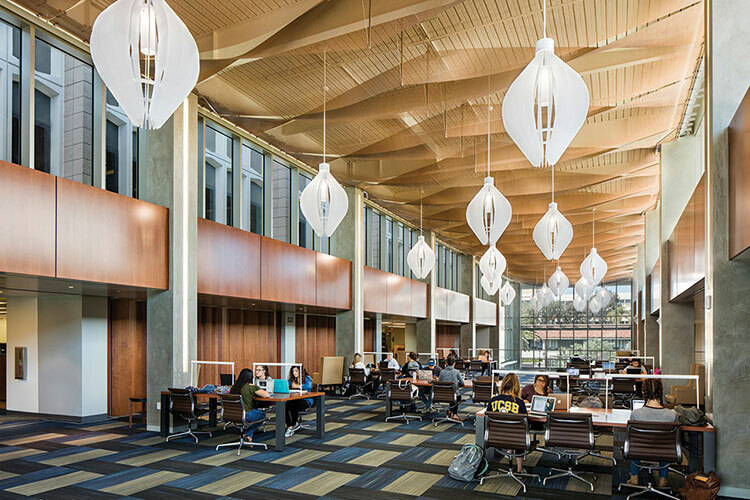 The University of California, Santa Barbara updated and expanded its library to include a spacious, open three-story addition with large windows that flood the space with light. 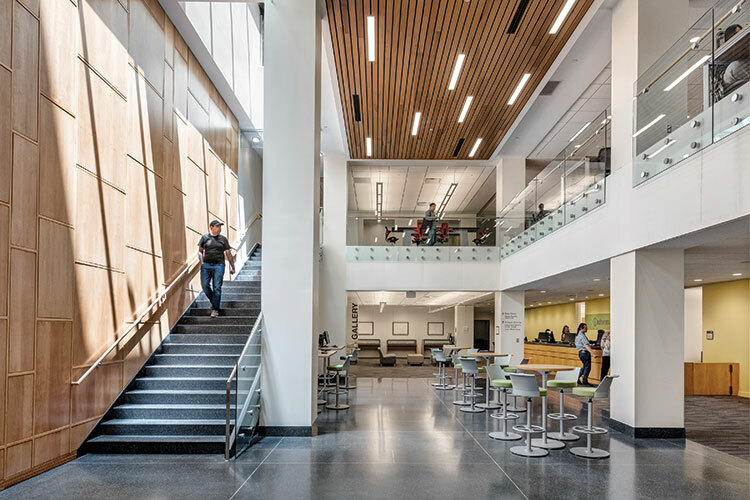 The first two floors serve as a 24/7 information commons with group study spaces, interactive rooms, and a café, while the third houses special collections. 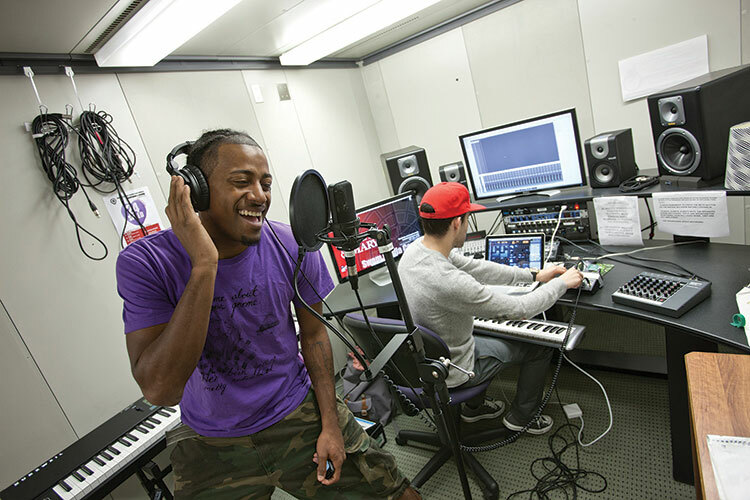 The Do Space is a community technology library housed in a former big-box bookstore space. 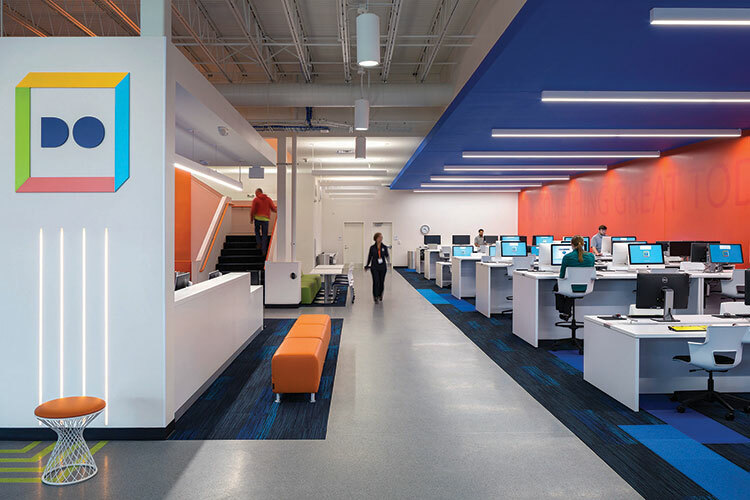 The first floor of the sleek, renovated facility features a computer lab, a makerspace with a 3D printer and laser cutter, an area for children and teens, and a meeting room for public use. 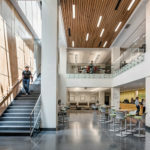 Metropolitan Community College offers classes on the floor above. 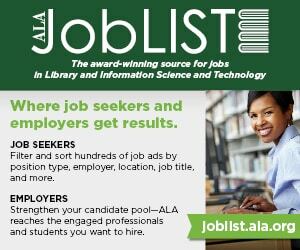 The library is the crown jewel of the new Las Cruces (N.Mex.) High School. 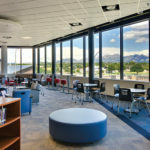 Located on the school’s second floor, it includes two wired classrooms, a makerspace, a café, two conference rooms, and large windows that provide impressive, panoramic views of the Organ Mountains to the south and east. 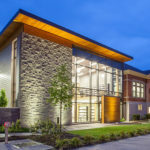 Grant’s View library takes advantage of its surroundings. 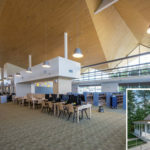 Patrons can use the quiet reading spaces, computers, and community meeting spaces while enjoying views through a two-story glass atrium of historic Grant’s Farm. The 281-acre ancestral home of the Busch family was named for President Ulysses S. Grant, who originally worked a portion of the land. 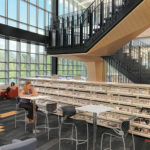 Wedged among homes, a railroad, big-box stores, strip malls, and other commercial developments on the Dixie Highway, the new Southwest Regional Library was designed to pop out from its surroundings. 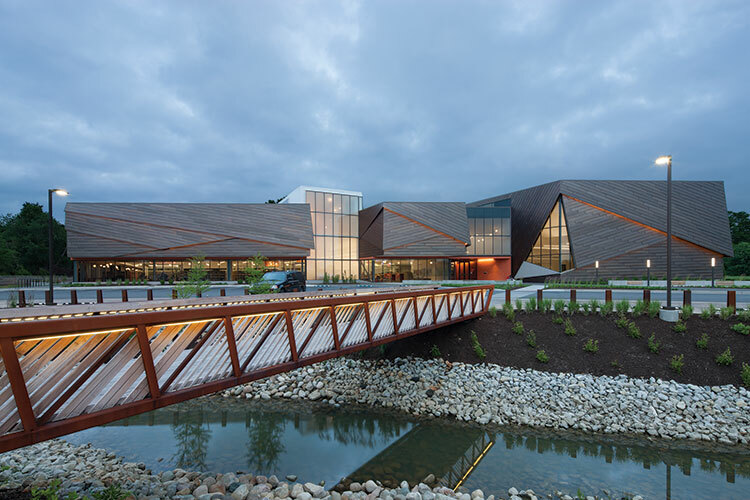 Behind the striking geometric façade lies an interactive learning center with 100 public computers. 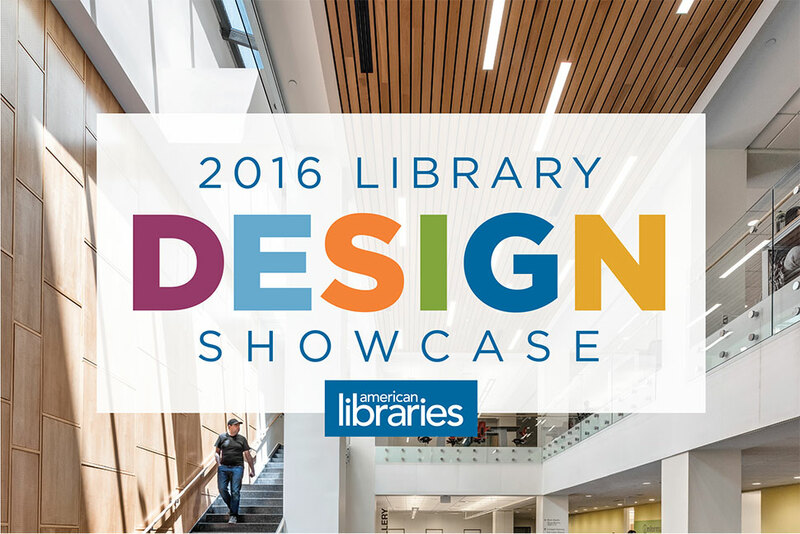 It also houses the largest children’s library in the Louisville Free Public Library system. 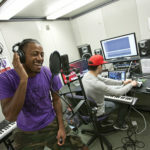 The Reeder Media Center in the renovated Earl Gregg Swem Library allows students to flex their creative muscles. 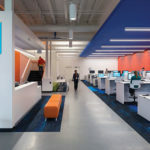 The redesign transformed an outdated, confined space into a state-of-the-art multimedia suite complete with audio and video production capabilities. Chicago Public Library’s new Chinatown branch serves as a hub for its community, providing a technology-driven space for public gathering. 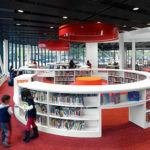 The south-facing entrance, softened triangular shape, and interior circulation draw on feng shui design principles, especially in the children’s section. 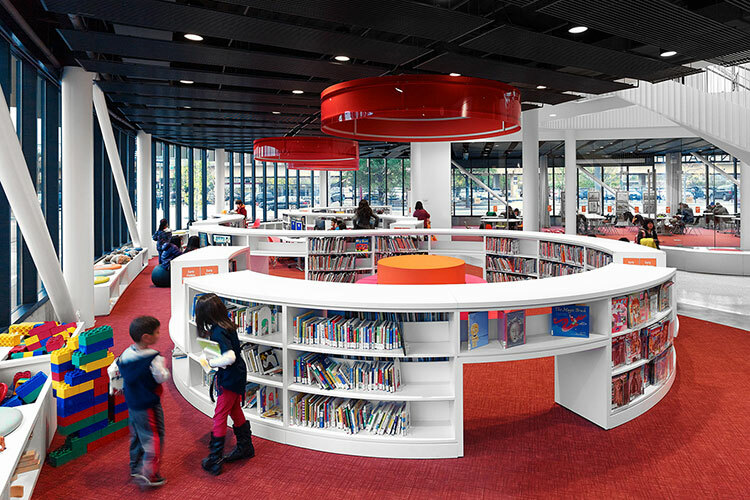 Sinuous low shelving mimics movement, creating active spaces for young minds and imaginations. 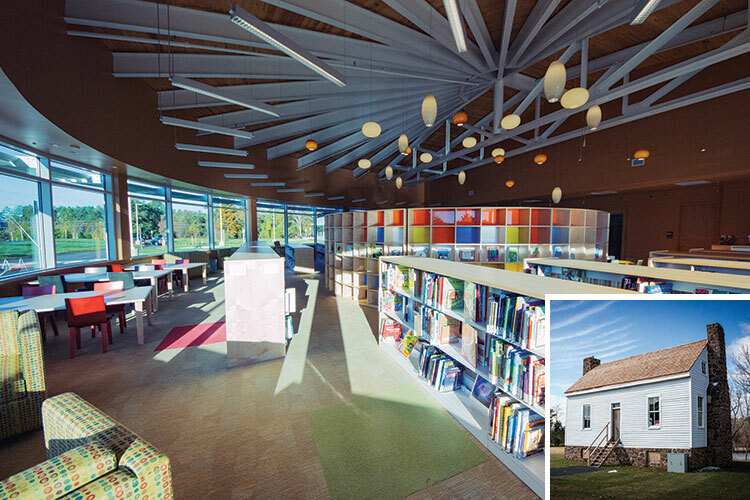 Nestled in the rolling hills of western Prince William County, Virginia, the new Haymarket Gainesville Community Library features warm tones and bright spaces, particularly in a massive community room with a vibrant, multicolored, domed ceiling. 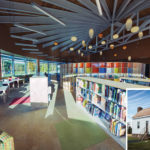 The surrounding grounds are home to the restored Bushy Park historic house, a frontier structure dating to the late 18th century that was moved from its former site to the new library, where it will serve as a reading room and community space. 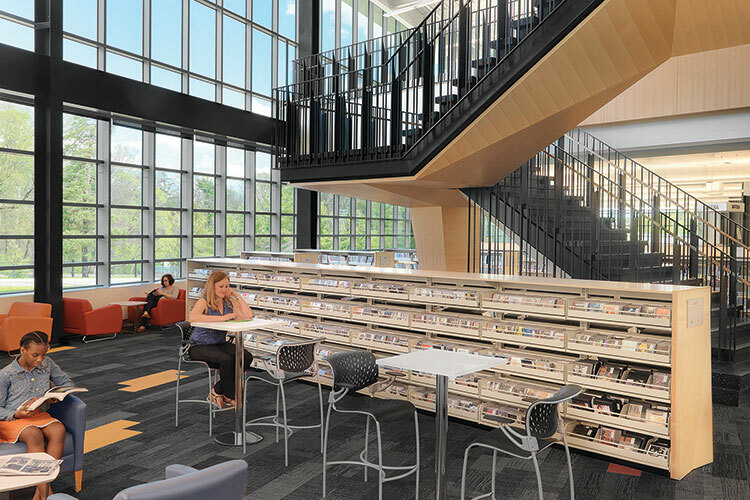 The open and airy Montclair Community Library serves a bustling suburban community. Its large windows provide views of a stone terrace used for outdoor performances, as well as of the Barnes House, a home built in the 18th century and owned by freed slaves. Moved from its original location to protect it from encroaching highway development, the restored Barnes House is now a reading room and backdrop for local history presentations. 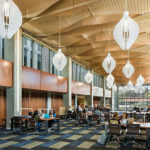 The James Branch Cabell Library was transformed from an insular, midcentury building into an expansive facility with 93,000 square feet of new space that allowed for the addition of a multimedia production suite, a makerspace, an expanded coffeeshop, and 25 study rooms with 274 seats—double the seating capacity of the original building. 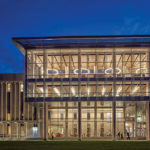 Gould Evans turned a 1970s-era concrete library into a 21st-century civic institution, renovating the existing building and wrapping its perimeter with a continuous reading room, emphasizing places for gathering and learning. 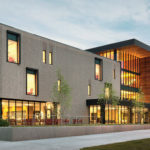 The addition also provides a thermal envelope engineered to harvest daylight and reduce energy usage. 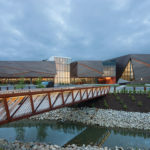 An impressive park plaza was added outside with a stepped amphitheater, space for outdoor events, and support for an ice-skating rink. 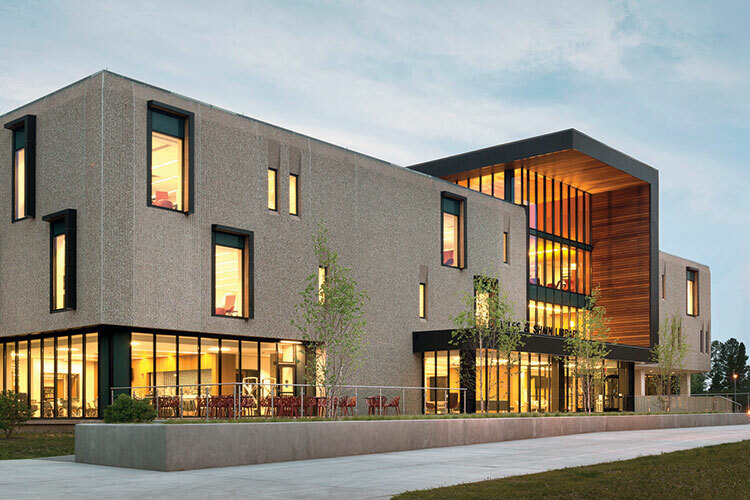 Schwartz/Silver Architects renovated a mid-1970s building to create a thoroughly modern academic library. 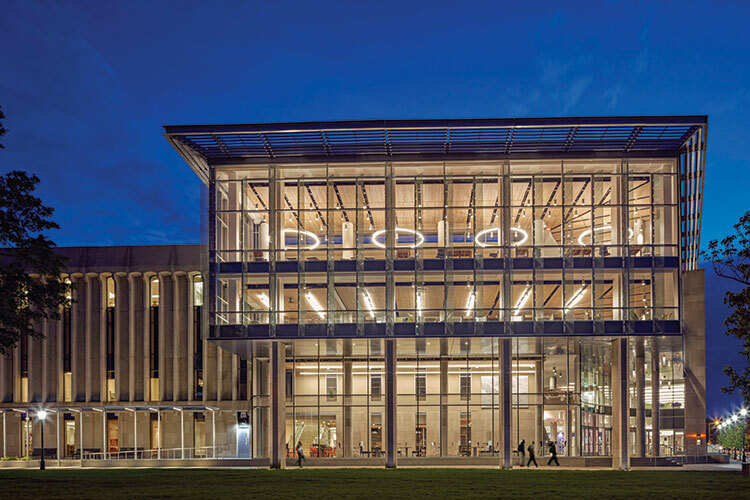 A glassy new exterior with large windows replaces an imposing façade, creating an inviting entrance that allows more light to enter the library. 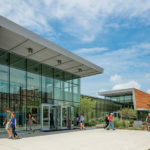 The renovation also added a new research commons and a digital scholarship and curriculum center. 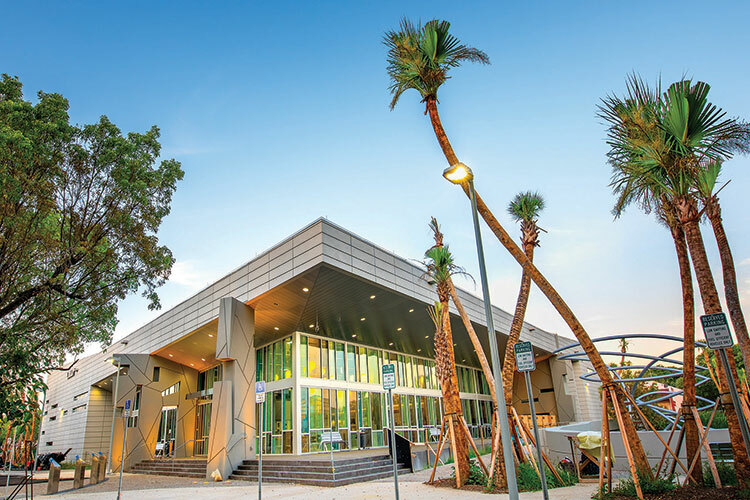 This new, single-story library maximizes its exterior spaces. 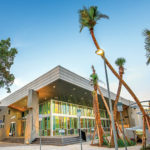 Patrons can enjoy its two courtyards, covered terrace, and retention pond full of indigenous aquatic plants, while a harvesting tank collects rainwater for irrigation. Large windows bring the outdoors inside, providing views and an abundance of natural light. 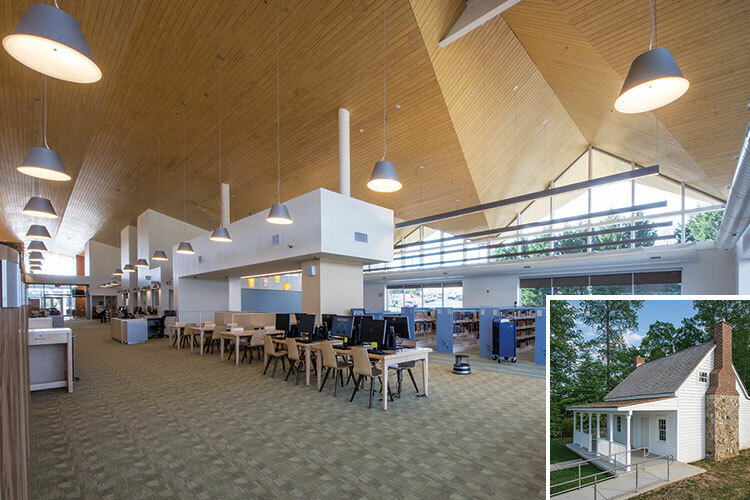 EOP Architects restored a 1904 Carnegie library to its former glory, adding an expansion that looked to the future while embracing its past. 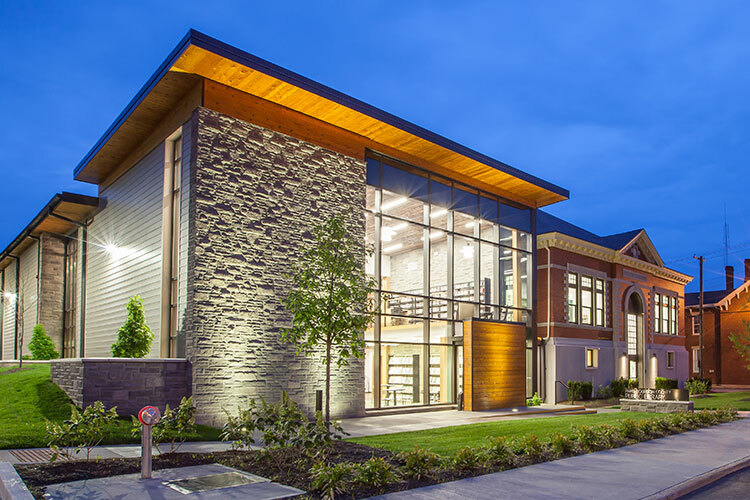 Reclaimed wood, handcrafted metalwork, and limestone hewn from the site were used throughout the new construction. 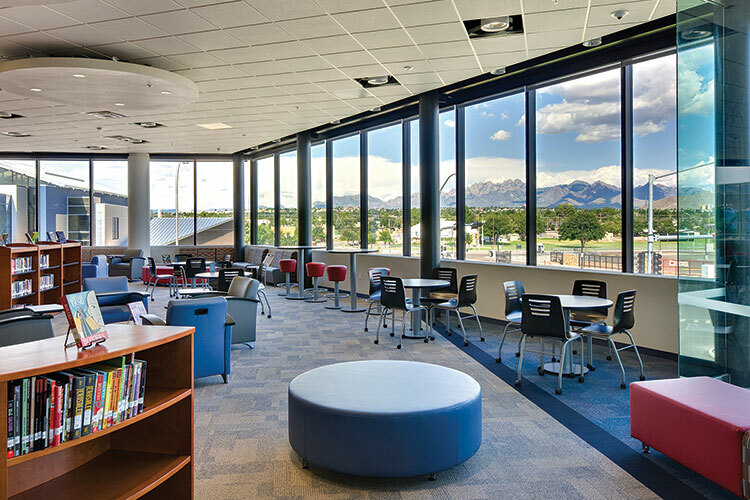 The expansion’s windows also allow more natural light to flow into the original building.